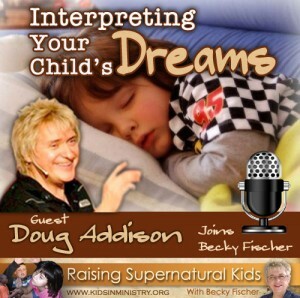 Becky Fischer interviewed prophetic minister Doug Addison in this week’s show titled Interpreting Your Childs Dreams on Raising Supernatural Kids. Doug is an experienced prophetic minister, dream and tattoo interpreter, and is also a professional stand-up comedian. He’s been doing this type of ministry for over twenty years. Doug says he has interpreted over 25,000 dreams in his ministry career. Doug fully believes God is speaking through children today specifically in the area of dreams similar to the way he spoke to young Joseph in Genesis 37, who received two dreams about his great calling in God. Recognizing the dreams and callings of children will help them fulfill the highest calling on their lives. But also major plan of darkness right now is to give children nightmares, which in turn causes them to grow up fearing the supernatural. But Doug revealed how nightmares can be flipped to reveal that there can actually be good things, and things of destiny hidden in them as well if looked at in a different way. During the show, Doug gives simple ideas of how to interpret your childs dreams, visions, or nightmares by using clues from the scriptures. He explains the difference between prophetic ministry and what “psychics” do. Becky read several dreams and nightmares of children sent in by parents, and Doug interpreted them on the show. The live callers called in their dreams as well.